Schroth Exercises Are Customized for Your Unique Spinal Deformation. Correct spinal rotation and increase lung capacity with a rotational breathing technique. Help restore normal spinal position with pelvic corrections, breathing technique, and stabilizing isometric contractions. Improve your posture during routine daily living, not just during therapy. 24-year-old woman with extremely severe scoliosis and atrophied left side. After three courses of intensive Schroth treatment, each of 3 months duration. After four in-patient courses. Treatment in this extraordinary case was significantly longer than usual. "I have remained an adherent of Scroth therapy right up to the present day. I haven't been sick in bed for one day in 50 years, and I'm also not under doctor's care or on any drugs. Despite my 88 years and severe scoliosis, I'm still fit." For at least fifty years, clinical studies of scoliosis frequently have reported paraspinal muscle imbalances of strength, diameter, length, fiber type, or electromyographic activity. They support the Schroth thesis that scoliosis always involves asymmetrical muscle groups in the back and elsewhere, which in normal bodies are more evenly symmetrical. In a typical scoliotic configuration, depicted at right, back musculature pulls lower ribs so that the lumbar (abdominal) region rotates laterally, downwards, and backwards. To maintain the torso's upright and forward orientation, the thoracic (chest) region must twist back in the opposite directions, and the cervical (neck) area responds with a third abnormal twist. Other imbalances are often present in the legs and feet. The resulting eccentric loads predispose the scoliosis to a vicious cycle of progression with unpredictable outcome. 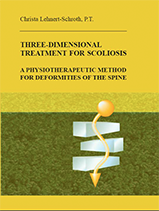 In its effort to reverse the scoliotic spinal rotations, the Schroth method of scoliosis exercise therapy addresses all three planes -- sagittal, frontal, and transverse. This means that correction needs to occur not only from side to side and front to back, but also longitudinally: that is, the spine which has shortened because of rotation must also be lengthened. Hence the Schroth method's designation as "three-dimensional" therapy. The Schroth method places great emphasis on conscious correction of posture during routine daily living, not only during strenuous exercise periods. Each patient learns about her or his own body and what she/he has to do in order to reverse and control abnormal posture so that improved posture becomes a habit. The following photos show a female patient with a very severe case (over 100-degree curve). On the left she slumps, not thinking about her posture, and unconsciously allows the three torso sections to become exaggerated and clearly recognizable. Her thoracic section is clearly twisted against the lumbar region, and her shoulder-cervical region compensates with a counter-rotation against the thoracic section. This reversion to faulty, scoliotic posture is akin to performing a wrong exercise. Left uncorrected, the posture could allow the deformity to progress further. In the photo on the right, she corrects her posture as far as possible. She uses the chair's back rest to widen her concave left side and fills it out further with the Schroth rotational breathing technique. By correcting her posture, she not only improves her appearance, becoming somewhat straighter and taller, but also increases her lung capacity and reduces the tendency for posture-related pain to develop. Scoliosis is characterised by a more or less pronounced change in the balance of forces, starting already in the feet, legs and hips, with inequality of muscles in terms of length and size. The greater the deviations from the midline, the longer the affected muscles become and the more volume is lost. They become flaccid and finally inactive. They lose their supportive function. Shape changes are only possible because the muscles permit them to happen. They become longer or shorter depending on the direction in which the trunk is moved and rotated. 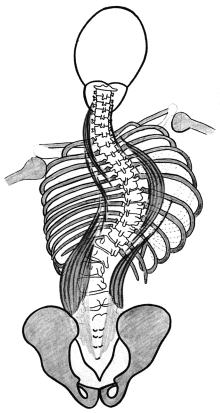 In other words, deviations of the trunk to the side or backwards can only develop if the corresponding supportive muscles give way and become elongated. The basis of correction is a properly aligned pelvis. A scoliotic pelvis is often not only shifted laterally but also tilted and rotated. Therefore the spine, which attaches to the pelvis via the sacrum, has a misaligned foundation. The Schroth method first addresses the patient's pelvis position with five corrections. The treatment can then focus on spinal elongation, and on derotation by means of individually designed scoliosis exercises. One of the primary Schroth tools is strengthening exercises tailored to the individual patient. Another, the unique rotational breathing technique, focuses on vertebral derotation using the ribs as levers, as well as on increasing the patient's vital capacity. Read about Exercises for Scoliosis to see a few sample Schroth method scoliosis exercises designed for a specific patient.